Depauville Free Library and the Indian River Lakes Conservancy are sponsoring a new series of four Nature Talks this winter. At noon on the last Saturday of the next four months, Depauville Free Library will be the site of a wide range of locally significant discussions. The talks are free and open to the public. Depauville Library will also be providing a light lunch as part of its Stone Soup Saturdays. While this series generally focuses on the nature of the external world, January’s talk emphasizes nature as the inherent character and features of a thing. 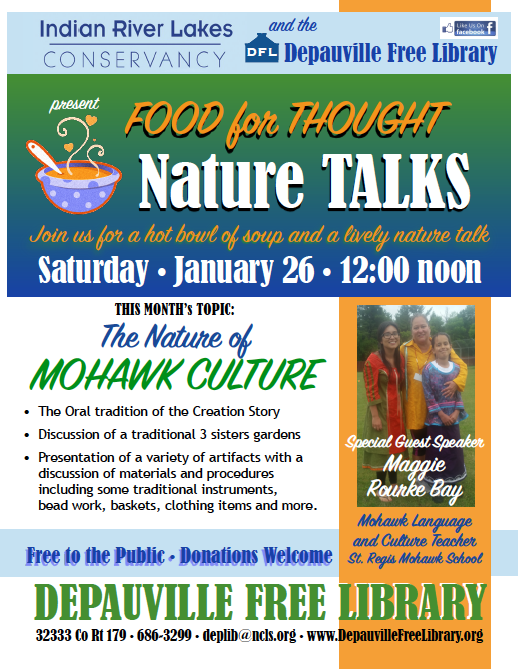 “The Nature of Mohawk Culture”, on January 26, will be presented by Maggie Rourke-Bay, Mohawk language and culture specialist at the St Regis Mohawk School. The oral tradition of the Creation Story and the traditional Three Sisters garden will be discussed. A variety of artifacts, including some traditional instruments, bead work, baskets, and clothing items, will be presented, with discussion of the materials and procedures used in their creation. Maggie Rourke-Bay is half Mohawk and has lived in Akwesasne for almost 25 years. Born in Alexandria Bay, into a family from Clayton, NY, she spent time back and forth between the 1000 Islands and Akwesasne until moving permanently to Akwesasne in 1997. Maggie and her husband, Wilfred, both work for their communities. Wilfred, working for the Tribal Council as a division director, oversees the Home Support Program, the Indian Child Welfare Act, the Child Support Program, and many others. Maggie, with an Associate’s Degree in counseling, a Bachelor’s Degree in psychology, and a Master’s in the science of teaching, is a teacher at the St. Regis Mohawk School, instructing 200 Kindergarten, 1st, 3rd and 5th graders and also teaching Mohawk Language and Culture as a special. She also arranges for the vendors, presenters, and culture programs at the Mohawk School. The Mohawks, or Kanienkehake, People of the Flint, are one of the original members of the Iroquois Confederacy. The founding constitution of the Confederacy in 1142 brought the Seneca, Cayuga, Onondaga, Oneida, and Mohawk nations under one law. Together they were called the Five Nations by the English, and Iroquois by the French. The Tuscarora joined around 1720, and collectively they are now called the Six Nations. The Iroquois prefer to be called Haudenosaunee, meaning People of the Long House. The longhouse was a metaphor introduced by the Peace Maker at the time of the formation of the Confederacy meaning that the people are meant to live together as families in the same house. The system of clans, or family lineage, is still kept intact. Among the Haudenosaunee, descent and consequently clan membership are traced through the mother’s family line only. The Kanienkehake strongly believe in perpetuating their language, songs, dances, and special ceremonies in the old way within traditional Longhouses. Failure to keep sacred this tradition would be in violation of the teachings passed on by the Creator. “Tetewate’n:ro:ta’non ska’niko’n:ra ke’n ke’nhak” – “Let’s be partners and use one mind” – is a saying seen on the St. Regis website. Maggie Rourke-Bay’s talk can be a good beginning. The three remaining Nature Talks scheduled in this Depauville Library/Indian River Lakes Conservancy series continue at noon on February 24 with Dr. Michael Twiss, Professor of Biology at Clarkson University, discussing the impacts of road salt on the environment, in a talk entitled, “Slippery Slope”. “Fighting for Survival: the Secret Lives of Turtles”, is the title of the presentation on March 30, given by Dr. Sara Ashpole, Assistant Professor of Environmental Studies at St. Lawrence University. The winter series concludes on April 27 with DEC Region 6 Environmental Engineer, Jennifer Lauzon’s, “Trash Talk: Reducing and Reusing to Curb our Take and Trash Economy”. For more information about the IRLC/Depauville Free Library series of nature talks, please contact Depauville Free Library at 315-686-3299 or deplib@ncls.org.